Some of the cast from 'Ros na Rún' in Galway. 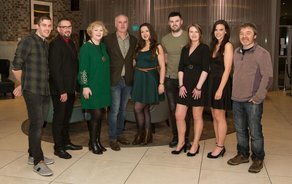 The cast and crew of TG4’s Irish language soap, Ros na Rún celebrated the completion of Season 23 in Galway this week. The wrap party was well deserved after 150 cast and crew finished up six months of filming. This was is the first season that the show filmed in High Definition (HD) following a complete refurbishment of the set at a cost of €1 million during the summer break. The cast too got a bit of a makeover, as the studio altered its approach to make-up to ensure it was HD friendly – and despite some apprehension, the new system has proved popular not only with the cast and crew but with audiences at home too. The picture quality is now second to none and has brought the fictitious village of ‘Ros na Rún’ to life in many sitting rooms across the country and indeed across the world as the soap is watched on the Player by thousands of fans living abroad, particularly in the UK, the US along with a number of other small pockets across the globe. This season continues to be broadcast twice weekly on Tuesdays and Thursdays on TG4 (with selected subtitles available) and an omnibus on Sundays. The show is co-produced by Eo Teilifis and Tyrone Productions. ‘Ros na Rún’ is currently the only Irish rural-set drama and broadcasts for 41 weeks of the year, with a total weekly viewership figure currently standing at a significant 150,000. This year the drama gave its audience tears of joy, sadness and anger and viewers are promised there are still a few more surprises in store between now and the end of the season on June 13th, 2019.